Thank you so much for the cards!! I can’t begin to tell you how much we all love these cards. We all laugh about the fact that most of our family initially thinks that we made the cards ourselves! I absolutely love the cards. Again, thank you so much for all that you do to support us. You make this challenging time in our lives much easier to remain close with our family and friends and we are grateful for your dedication. Please be sure to thank everyone for us who volunteered their time to make the cards. Thank you soooooo much for the beautiful cards. Everyone LOVES them...I always make sure to put a card in everyones hands to make sure they write home...One gentleman in our office said "My wife is probably wondering when I got so romantic"...Thank you for giving us the opportunity to stay in contact with our loved ones....!!!! Being away from them is hard and this makes us feel closer...it keeps us connected from a distance!!! We received your cards today. I couldn't ask for any quicker response on this! Thanks for your faithful dedicated service in getting cards to Soldiers. Here are the latest links to pictures that were posted on the Washington Post of our guys. I hope some of you get to see your husbands in these great pictures that were taken. I have been told that the photographer Nikki Khan left our guys a couple of days ago so that may be it as far as pictures go on Washington Post, but still check just in case. A CNN reporter was embedded with our guys and Delta Co. for awhile. If you go to CNN.com, you will find numerous videos of our guys. There will be another reporter joining up with Charlie Company soon but I am not sure who or when. Just in case I'll start you off with one link and you can go from there. Delta Company has suffered three casualties and a few injuries. Please keep them in your thoughts as well when you think of your own loved one. Here is a link from a the last memorial. I hope this e-mail finds you well. We are in our last few days in Kuwait. Looking forward to being back with my [wife] and the girls. Our replacements, the 180th transportation Battalion is on the ground and starting to take over the operation. I have included their XO*, MAJ M.M and their chaplain, CPT K.B. in the cc line. I know that they will love to be able to share the amazing cards with their soldiers. Again, thank you for your kindness, generosity and all of your support this year. You are a true patriot and have been a great friend to the 6th Battalion. Thank you so much. I came across your cards when I was transitioning from Manas AB to Bagram and I fell in love with them. Thank you for what you do. This is my first time in Afghanistan and my family back at home is so worried about me. I used your cards to give them a warm fuzzy feeling and to tell them I’m doing okay and that everything is fine. I’m so glad you have folks out there who make these cards for us. AAFES has cards, but it’s not the same. Thank you and your team for thinking about our Soldiers, Airmen, Marines and Sailors. Actually, it means the cards made it to Iraq, one made it to my hands, and then the card made it half way around the world to my wife, who was duly impressed. She had posted this beautiful card on her blog. Be sure to click the link above that the hero provided so you can read the story for yourself! If you're the cardmaker for this one, please email us and let us know - we'd love to credit you on the photo!! This is the note written by the husband as a comment on the blog, if you missed it when going to the link above. I thought it was the most awesome one in the box! The group sent one of this GIANT flat-rate USPS boxes, just jammed full of all kinds of awesome cards — we were all like kids in the candy store, sifting through birthday cards, I love you cards, and so many other kinds. It was one of the neatest care packages I have seen in a long, long time. Love your program. I'd never heard of it, but it's stuck in my head now, for sure. As an aside, I have to say -- I am duly impressed with the full-throttle approach of the group. Twitter? Facebook? Myspace? A blog? I think you all are hitting all the big ones! I think you are likely doing more to reach out and interact with your supporters, than most rock bands do. And you get extra cool points for the creative commons licensing. So, when does the iPhone app come out? Anybody have a contact at Apple who can make us an iPhone app for cardmaking?? Maybe it can make digicards....lol! We just got the box of cards today. Perfect timing! The other day, I was looking out thinking that the card rack looked like it was getting low. Thank you for the cards and let everyone know that they are going to good use. I had someone come in the other night and say that this was the only place they could get cards that they needed and wanted. It's a real morale booster for Soldiers and civilians. Thank you for all your support! You put something special in our day. From the soldiers of TF Spartan, thank you! This was so fun we had to share it here....CFH helped Soldier's Angels get a huge donation of coffee out to deployed service members. This 24" x 36" poster came from one happy unit! Glad to read you received the card. They really do mean alot. Actually I am sitting here writing another one. They have come in handy so often. I love to write! Thanks so much for what you do. I cannot begin to show how much they mean to me. So please pass my appreciation to the many who donate time and resources to make the cards. I received the box of cards today, it was enjoyed by all...not only the letters written to 'hero' but the numerous handmade cards. We all have family and friends that we love to keep up with and these cards will help us do that. These cards will be enjoyed by a lot more than just the Soldiers sending them. I cannot thank you enough! After some of the Soldiers in my section grabbed a few, I gave the rest to our Chaplain as they reach more. I can tell you that these cards are better than any store bought cards and love that goes into them will carry on. I am a mother of two and my children don't get to hear my voice very often, but the cards they hang on the fireplace...something they cherish during our time apart. Again thank you. Again, the cards and packages have made such a difference to us all. I know personally how much [my wife] and the girls have loved them. She has kept all of them in boxes, so that they will keep them and know that no matter where I was, I always sent my love. Greetings everyone! It's July! Wow, time flies when you are in the desert. And I'm afraid I owe everyone an apology. I've been so swamped with work, I haven't been able to keep up. I'm sorry but my job requirements are increased and I am unable to send individual thank-you's to everyone. I don't want to stop what I'm doing, so I've had to find ways to make it less time consuming. Instead of SPC P.H. I'm now SGT P.H. I know military addresses are kind of confusing. SPC is an abbreviation for the rank Specialist, and SGT is an abbreviation for the rank Sergeant. Yes, I've been promoted. In addition, my boss went on vacation and I've been in charge of the Communications shop since he's been gone. Sufficed to say, with my new rank and increased responsibilities, I haven't had much free time. I am pleased to announce, that on the third of July, we had the grand opening of "The Area 51 Morale Center." With almost 45-50 soldiers in attendance it was quite the party. In addition to hamburgers, hot dogs, sodas and cake, we had music, a dominoes and spades tournament, and a Wii bowling tournament (all with prizes). Our morale table was well stocked with snacks, personal hygiene items, blank cards, powdered drink mix, and health care items. I now have five wall lockers to store everything for Area 51. Two for food and snacks, one for games, one for hygiene/health items, and one to store the boxes of care packages that I distribute to soldiers. Once a month we will be having morale event at the center, similar to the one at the grand opening. I am pleased to announce that the Area 51 Morale center has been very well received, both by the soldiers it is serving, and my chain of command. However, this event (and the entire morale center itself) would not have been possible without your help. On behalf of Headquarters Support Company I-Corps, I would like to offer you a most sincere thanks for your continued support. beautiful handmade cards to mail to our loved one's back home. Thank you once again for your assistance and your time! I just wanted to let you know I received the box of cards you sent and wow, how impressive! What a great thing to do for us while we are over here. I shared them with the folks in my unit and the remainder are going to the USO here where thousands of service men pass through every day. Your cards will make a big difference for a large number of folks. If they would like more for the USO, do you want me to let you know? Great news!!! The cards have arrived! Thank you so much, they are beautiful. I put 2 very cute cards in the mail today for my girls. Our replacements will be here in a few days, and I will pass along your contact information to my counterpart. I know that he will be very excited to be able to help provide these cards to our Soldiers. I know that the new Soldiers will love them. I was told about your donations by another soldier within our base. He had cards and I thought it was such an awesome idea. We do not have access to any kind of greeting cards and I thought this was such a cool idea. He showed me a few of the cards he had and I thought they were so neat. I would love to be able to offer something like this to the soldiers I work with. Thank you for what you are doing. God Bless! I talked to my husband today July 7th and he said that he already recieved the cards. I am very impressed with your quick response. I cannot thank you enough for all of your hard work for our troops. He will give the extra cards to the new USO center that just opened there this past weekend. I have about 50 cards done so far and will send them to you soon. I got the box of BEAUTIFUL handmade cards that you sent...thanks so much for caring. My guys appreciated the last box so much and I'm sure this box will be just as popular! It is especially reassuring that so many different folks from around the country are taking the time to think and act for the troops. Makes it that much easier and rewarding to be doing our duty...so thanks again. My team and I are so very happy for the cards we received. They have come to us like a gift from above. You ought to call yourself an angel. We are so humbly honored be the recipients of such great gift made with love across the United Stated just for us. The team have used the cards and shared with others here in Baghdad. Everyone that sees the cards are amazed and ask who did them. They are very thankful to have the cards and sometimes they comment that there is no excuse not to send one of these beautiful cards to make somebody smile back home. One of the cards most fervent fans is my five year old daughter... not to mention all the brownie points I gained with my beloved wife. We thank you and cards for heroes so very much for what you are doing for us and for our families. Continue to bring smiles to every Soldier's heart. - the coffee will keep us alert for a good long time. I promise that we will continue to do our best and make you proud by protecting our beautiful people and bringing freedom to our most precious nation. May God bless you always! 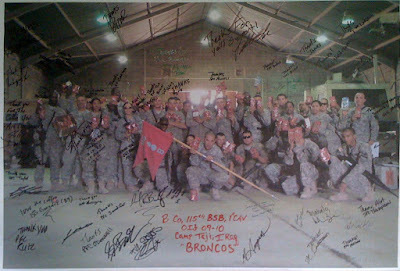 My Best Friend SPC V. was traveling through Bagram and found these and brought some back to our small FOB with her. They are so lovely and funny, thank You for sharing them with us! My husband Jason is among the 4,000 marines that has been recently talked about all over the news. He's been gone since May 03rd and it's felt like so, so much longer. Our guys only had one month and a half to train, in the middle of all that we were married. He's one of the few men that genuinely wanted to go, he was suppose to get out in August and now he chose to push that back to February because he could not leave our men this time. It's been so difficult, I write not only him daily, but several other of his friends who don't have many people. I miss them all terribly. Today I recieved a beautiful card from him and found your website on the back of it. Thank you SO much for making this possible, it made my really bad day that much brighter. Thank you so much for all the work you guys have put into this, we really appreciate everything! We received the box yesterday. Thank you so very much. They were gone within minutes....if you have any excess cards is there any way you could send some more out here???? Wanted to express my appreciation for all the work that goes into creating each card. The cards are so creative, I've sent a number of them to my wife, and I know she enjoys them. I am a civilian government employee deployed with the troops here in Baghdad. The troops here also appreciate the cards. I just wanted to thank you for taking the time to write me. It means a lot to me. I have never been called a "superhero" before, it made me laugh! Thank you. I hope that all is goign well with you and yours. Hope the weather there is great. Stay safe and God bless.